At the end of 2012 I left my ivory tower career behind and resigned from Charles Sturt University. For the past year I’ve been working as a Policy and Legislation Adviser with Jan Barham. I also did a little work while on leave from CSU for Jeremy Buckingham. 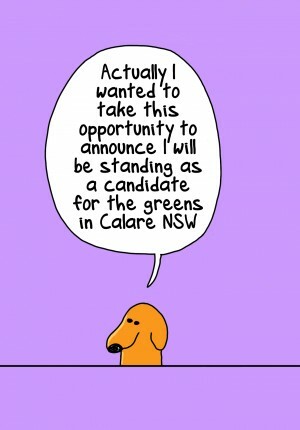 In August and September I took a short hiatus from my job and contested the federal election (big thanks to First Dog for the drawing I got to use to announce my candidacy). Home base remains Orange but work keeps me in Sydney from Monday to Friday most weeks. I haven’t written much during that time, outside of work. As we get to the end of a year I have some ideas in mind for things I’d like to approach differently and ways I can improve my sense of wellbeing. I’m not a fan of resolutions but do like to have goals and some semblance of a plan for how to achieve them. And writing more, especially on this site, fits into that. Although I don’t expect to formally publish much work for the foreseeable future, I do think communicating some of my ideas and experiences helps me by opening the door to more reflection and interaction. I still hang about on social media a bit, but I intend to start busing this as more of a home base for thoughts that won’t fit into a tweet. I have no more idea than him about what that will look like. It will probably be different for each of us. And I don’t expect I’ll really know until it’s done, which it never will be. But I’m starting by modifying the site’s setup to suit the things I’d like to do. Once that’s done I’ll be in a position to post more, and I hope to follow through on that. Stay tuned. Meanwhile, enjoy Christmas time and have a happy New Year.